>> Would you consider abortion in the following situations? Sanctity of Human Life Sunday is held on the closest Sunday to the anniversary of the Jan. 22, 1973 decision by the U.S. Supreme Court to legalize abortion in the Roe V. Wade case. Check the US Abortion Clock and see what the abortion statistics are. It really is amazing and unbelievable! Here are a few quick facts regarding life. 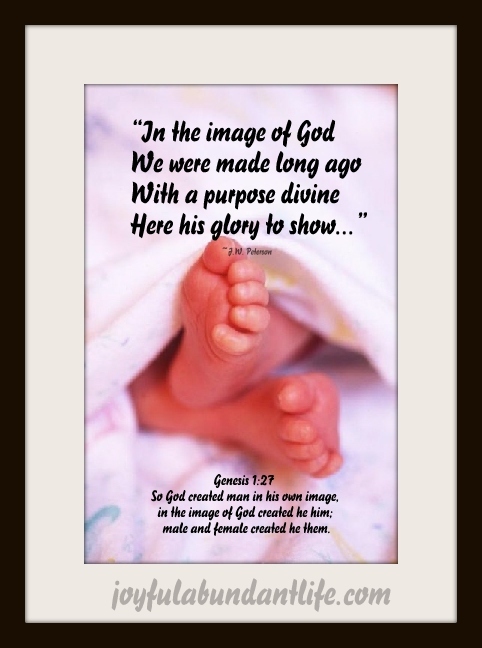 We are made in God’s image and surely life is precious in God’s sight. May we use ours for His glory! Day 1 – conception takes place. 7 days – tiny human implants in mother’s uterus. 10 days – mother’s menses stop. 18 days – heart begins to beat. 21 days – pumps own blood through separate closed circulatory system with own blood type. 42 days – brain waves recorded, skeleton complete, reflexes present. 7 weeks – Thumbsucking may be present. 8 weeks – all body systems present. 9 weeks – squints, swallows, moves tongue, makes fist. 11 weeks – spontaneous breathing movements, has fingernails, all body systems working. 12 weeks – weighs one ounce. 18 weeks – vocal cords work – can cry. 20 weeks – has hair on head, weighs one pound, 12 inches long. Would you consider an abortion in the following four situations? There’s a preacher and wife who are very, very poor. They already have 14 kids. Now she finds out she is pregnant with the 15th. They are living in tremendous poverty. Considering their poverty, and the excessive world population, would you consider recommending she get an abortion? The father is sick with sniffles, the mother has TB. They have four children. The first is blind, the second died, the third is deaf and the fourth has TB. She finds she is pregnant again. Given the extreme situation, would you consider recommending abortion? A teenage girl is pregnant. She’s not married. Her fiancee’ is not the father of the baby, and he is very upset. Would you consider abortion? In the first case, you have just killed John Wesley, one of the great evangelists in the 19th century. In the second case, you have killed Beethoven. In the third case, you have killed Ethel Waters, a well known black gospel singer, and if you said yes to the fourth case, you have just declared the murder of Jesus Christ! Here is a Mom and Dad. They have one girl, 18mo. Old. Mom is pregnant again. Mom and Dad’s relationship has not been the greatest and Dad is not happy about the pregnancy. There’s a good chance that this child won’t even have a dad or a very good home. Should the child be aborted? Well, dad thought so. He forced mom to take a pill to abort the baby. Mom got very very sick and had terrible cramps. Surely, the pregnancy would end. But God had other plans. We don’t know why God places certain people in these circumstances, but He ultimately has a purpose. The pregnancy did not end and another baby girl was born into this family. The Dad did not stay with mom long and he left Mom with two baby girls to care for on her own. That is not the end of the story. This baby girl who should have been aborted grew up and married a preacher. She has been a godly example to many ladies and has raised three godly daughters of her own. She is not just some person that I read about in a book. She is a friend of mine and has been a great influence in my own life as well. God had a plan for her as He does for all of us! The War on the Unborn Child- The Reality of the War on the Unborn Child.